The tally of barbeques got to five before colder evening temperatures forced us indoors on Monday. 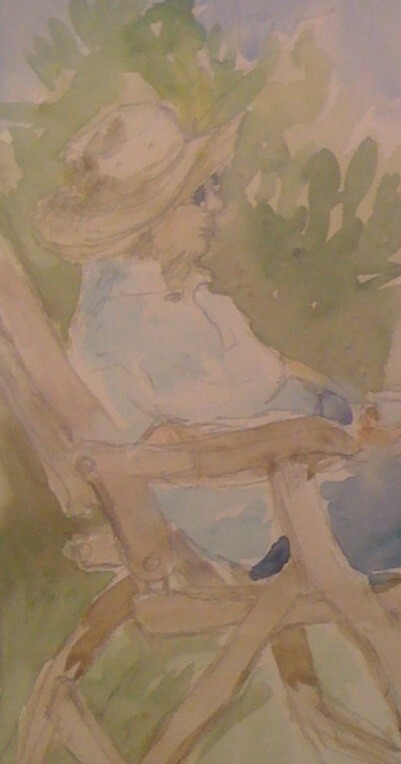 Lovely aunt was having a lovely time sitting out and enjoying the sunshine and flowers; this painting is a quick sketch of her in a silly sunhat. The pear trees and apple blossom are all coming out. 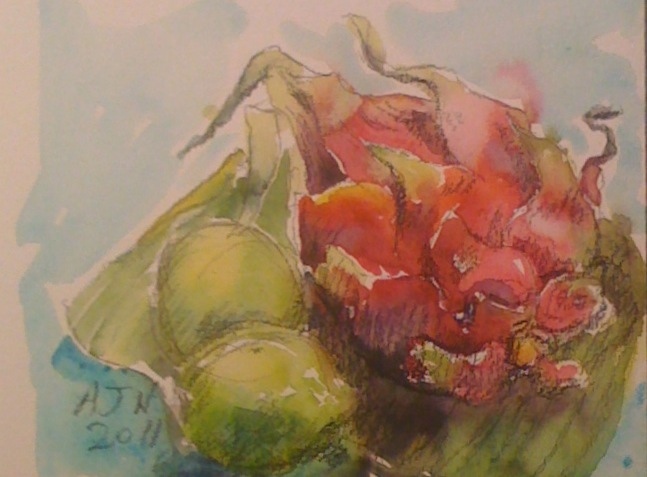 The tulips have completely trumped the daffodils now and are magnificent, there are some that are short and tiny, some that are taller and double, I still like my pinkish ‘New Design’ tulips best. Last night, unbelievably, the first asparagus was ready to cut-twelve small spears which were sweet and delicate. There’s nothing like being rung up and told that your child was due in school after a bleary breakfast when you dragged yourself out of bed only to be convinced half way through ( too late to enjoy going back to bed of course) that it was actually an inset day. We were sceptical and checked the school website…it was an inset day….I retrieved dinner money and set a revision paper….but the noble souls who teach my son were working through their inset day ( as well as doing the training presumably), in order to sort out the knotty bits that need to be fixed before the exams, they phoned to complain after the event. Damn, blast and double blast. All revision that occurs outside home and doesn’t involve major complaint sessions within earshot is worth real money in my book and today the money just rolled down the drain. I was humiliated and bound to apologise abjectly , as I lowered the receiver I turned to the snivelling brat responsible……. Last night and the night before we had a barbeque…as it was glorious again today a hat-trick was suggested…it’s that dreaded call, ” I’m on the TRAIN and I think we should have a BARBEQUE!”. I’d run out of ideas and cholesterol capacity so got trout from the supermarket and put them in a fish gadget which holds them together. They looked very enticing with the skins scorched and curled, bread, lemons and salad were all that were needed. The day time temperature on a north facing wall has been up to and above twenty -three days running so it has been warm enough to sit out until dusk. Last night I saw a pair of bats chasing each other, today I saw an orange tip butterfly the first in a few years. I am trying really hard to catch up on weeding and planting…I made some grim rotting corpse type discoveries in the shed, improper storage/extreme cold has cost me a very fine dahlia and some so so ones and a Colocasia .I will leave the final excavation until I am feeling braver. There are quite a few losses in the garden from this time last year, the raspberry scented Salvia is all gone, the Dryas colony has died ( calls itself an alpine too), a pretty delicate Hebe is toast or rather kindling and a delicate south African Rhodoxis? has turned to dust ( I am almost sure). I’ve lost all the Siberian wallflowers including a good looking cutting. I also lost most of the seedling Hellebores from last year but that was drought last summer not the cold. More hedge is succumbing to the honey fungus and so are the potentillas…however they are producing insane numbers of seedlings. I can’t believe it when they were so hard to grow from seed originally. 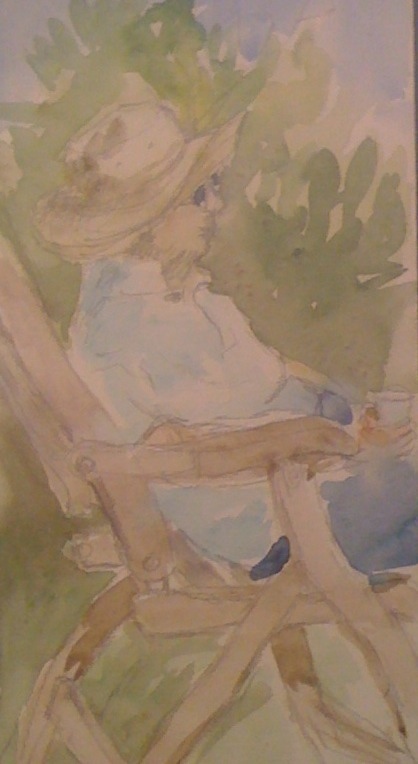 Lovely aunt is enjoying the good weather and the barbeques at which she claims to be an almost complete novice…I can’t believe she has missed everyone of the barbies we have transported to my mothers house in the past and cooked for the extended family; she was always at weekend gatherings there until my cousins whisked her off in a hurry to the cleaner air in Hampshire. Her description of this to the G.P. had the G.P. ‘s eyes doing that “ you are kidding me “ thing at me. I ended up muttering “don’t go there” as it is all very distressing for her still. I can’t tell their side of the story as they refuse to discuss it. 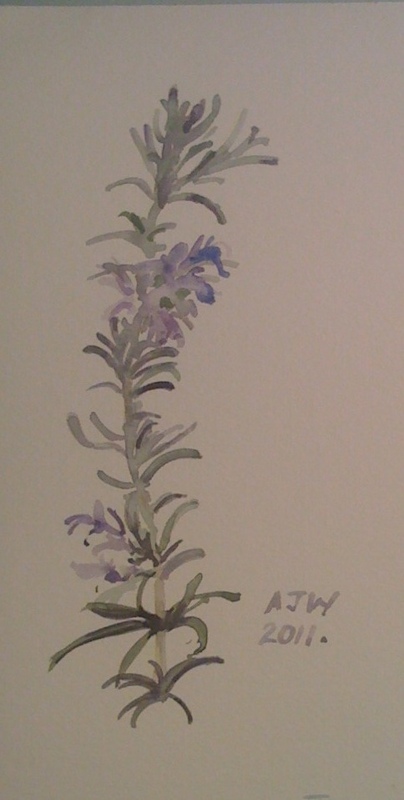 I have tucked some sprigs of rosemary and Siberian Wallflower (taken from mothers magnificent plant…how come…oh never mind) into the cuttings pot to try and get some new plants. The seedlings of Tiarella which I put out in the shady area last year are looking fantastic, fresh green plants which are starting to merge into effective ground cover (effective free groundcover). The apples are starting to come into flower Owen Thomas two days ago and Katy today. Onwards to the next barbeque day…. Today was beautiful. There were no appointments to make, the sun shone and I got some weeding done. I bumped into people in town who could do each other good once they were introduced and I had found that one needed to practice Spanish and one needed to practice English. Lovely aunt was happy and to cap it all DIY Dad got to incinerate food outdoors for the first time this year. 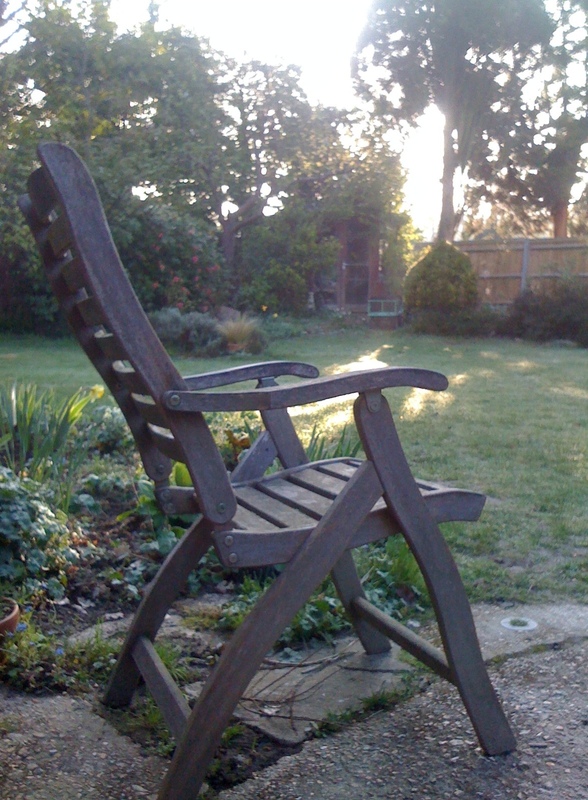 We sat out in the garden and watched the sun set as we waited for the food to be cooked. A crescent moon emerged among the peachy coloured cirrus clouds and a bat flew high among the oak trees before the light had even half gone. This morning I saw at least two brimstone butterflies, possibly a holly blue and later a large brown of some sort. I pulled seedling grass from the garden beds and probably thirty seedling of Hypericum , the garden is infested with self sown Linaria, Aquilegia, Geranium pyrenaicum, Prunella, Verbena bonariensis, Salvia, Verbascum, willow, as well as the usual docks, nettles, creeping buttercup, wood avens and forget-me-not. I leave the forget-me-nots and verbena and some of the others but the Hypericums have to go as do the sedges that sprout up everywhere. 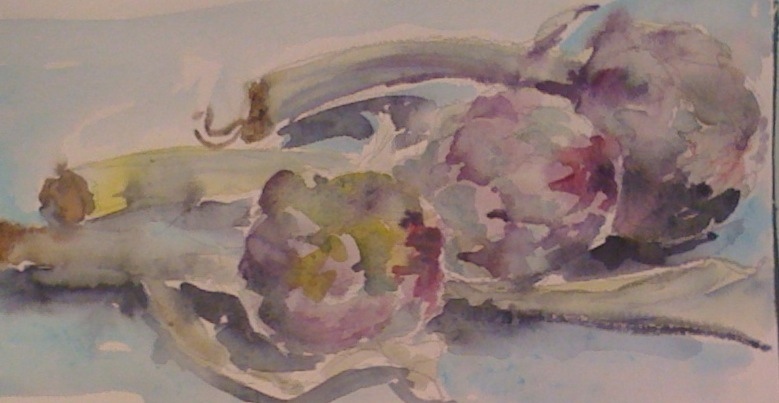 The painting is of a strange fruit , I have never eaten it , I will tell you its like next blog. It is certainly colourful. 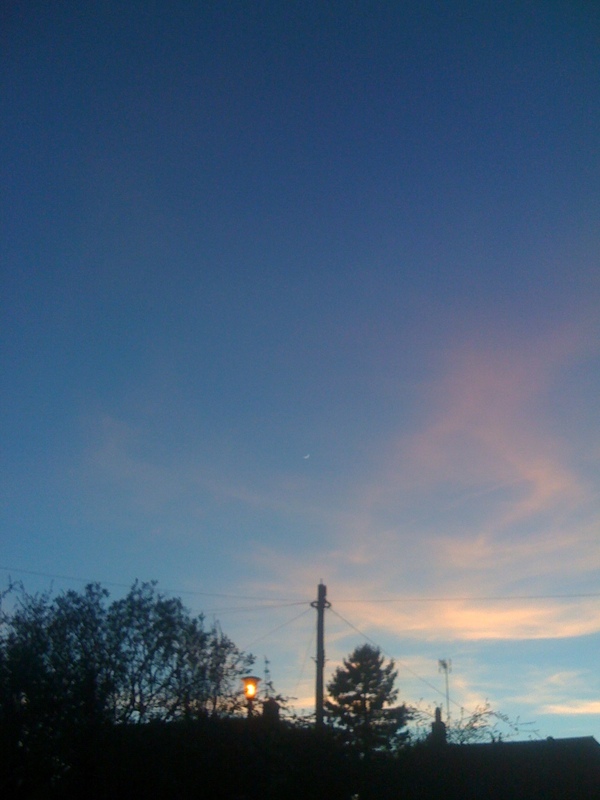 The photo shows the sky with a tiny moon. Artichokes from the Mercado Centrale Firenze. This morning the light was lovely.